DoSnapshot | A command-line snapshot maker for your DigitalOcean droplets. Fully Automated. Multi-threaded. Project Page at Digital Ocean, comment or vote for this project. Use this tool to backup DigitalOcean droplet’s via snapshot method, on the fly! 20.08.17: Change Barge to DropletKit. Release 1.0.0.
shutdown now disabled by default, no downtime anymore, YES! If you want shutdown back use --shutdown option. 08.01.16: now we have to use DO API V2 only, because V1 is not work anymore. 17.10.15: now we use DO API V2 by default, due V1 deprecation at 11.2015. Multiple threads out of the box, no matter how many droplets you have. Auto-Boot Droplet if Snapshot Event fails or encounters a bad connection exception. Special binaries for cron and command-line, Homebrew, and standalone installers. Mail notifications when a snapshot fails or the maximum number of snapshots is reached for a droplet or droplets. Custom mail settings (You can set Pony mail settings). Stop mode (automatically stop creating new snapshots when the maximum is reached). Timeout option for long requests or uncaught loops. Defaults to 600 seconds, but can be changed. $ wget https://assets.merqlove.ru.s3.amazonaws.com/do_snapshot/do_snapshot.tgz # if not done. Here we keeping only 5 latest snapshots and cleanup older after new one is created. If creation of snapshots failed no one will be deleted. By default we keeping 10 droplets. E-mail notifications disabled out of the box. For working mailer you need to set e-mail settings via run options. Preparing droplet id: 123456 name: mrcr.ru to take snapshot. Start creating snapshot for droplet id: 123456 name: mrcr.ru. Wait until snapshot will be created. 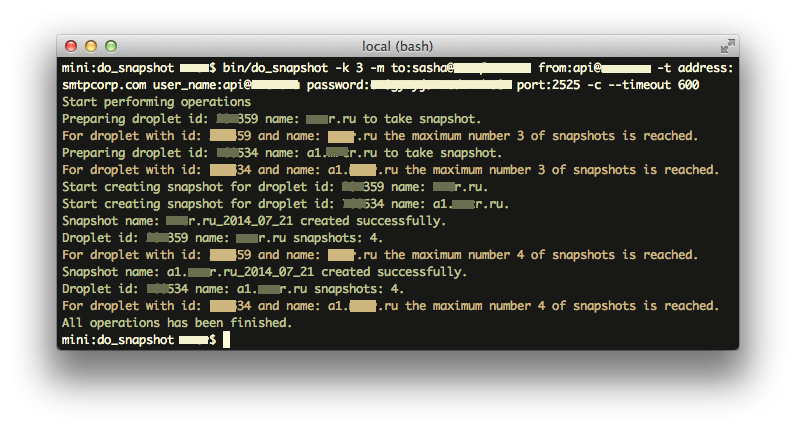 Snapshot name: mrcr.ru_2014_07_18 created successfully. Droplet id: 123456 name: mrcr.ru snapshots: 4. For droplet with id: 123456 and name: mrcr.ru the maximum number 3 of snapshots is reached. Cleaning up snapshots for droplet id: 123456 name: mrcr.ru. Snapshot name: mrcr.ru_2014_07_17 delete requested. All operations has been finished. -p, [--protocol=1]                                             # Select api version. [--shutdown], [--no-shutdown]                              # Check if you want to stop your droplet before the snapshot. [--stop-by-power], [--no-stop-by-power]                    # Droplet stop method, by it's power status (instead of waiting for event completed state). [--digital-ocean-access-token=YOURLONGAPITOKEN]            # DIGITAL_OCEAN_ACCESS_TOKEN. if you can't use environment. First. I needed stable tool, which can provide for me automatic Snapshot feature for all of my Droplets via Cron planner. I don’t want to think how much snapshots for each droplet i have. I don’t wont to sleep when my droplets Offline!!! And i wanted tool which can BOOT back droplets, which failed to snapshot. Also i want to understand what’s going on if there some error. Mail is my choice. But logs also good. So this tool can save a lot of time for people. Support this project and others by merqlove via gratipay. DropletKit for API V2 requests. do_snapshot is maintained by merqlove.